To pedal on the one of the India's most dangerous highway, all it took was determination for the 15 year old visually impaired, Manasvi Baheti. This 100% visually-impaired teen from Vidya Valley School completed a dangerous route covering Manali-Leh-Khardung La pass on a tandem cycle. The father of class 10 student accompanied her on the cycle. To help her achieve the dream, the expedition was organized by ABBF (Adventure Beyond Barriers Foundation). ABBF is a unique adventure organization that enables the person with disabilities and able-bodied people to participate and experience adventure sports together. ABBF was founded in 2014 that works mainly on 5 different parameters of Adventure - trekking, scuba diving, paragliding and mountaineering. Manasvi pedaled along with 10 other tandem pairs covering over 500 kms from Manali to Khardung La within two weeks. She was the youngest among all the visually impaired participant of the expedition. 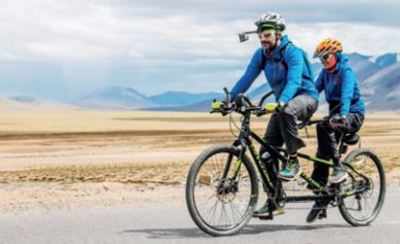 This has happened to be India's first blind and sighted tandem cycling expedition in the Himalayas, as claimed by the foundation. The founder of ABBF, Divyanshu Ganatra, said, "Our purpose is to establish a connect, build empathy and most importantly, remove the awkwardness associated with 'disability'. Manasvi is a spirited girl. She was the youngest participant in the expedition. This is a tough ride even for professionals, but the way she overcame the challenges was phenomenal." "Cycling was something Manasvi enjoyed as a child. We had been looking for a tandem cycle for a very long time. Tandem cycles manufactured by Cannondale were recently imported to India, and we were their first customers." said Manasvi's mother as she talks about her journey so far. "It was an amazing experience. We had to get up early, undergo medical check-ups, and stay in tents. The first day was challenging with the uphill climb, but it was mesmerizing to experience the slight snowfall. We crossed six passes. Reaching Khardung La was the best. It was a nostalgic moment and all the adults in my team were crying. I believe the 'Mountains make you babies'," said the delighted Manasvi!